With 7 different game modes and a free app, your eyes will light up at all that MiP™ can do. 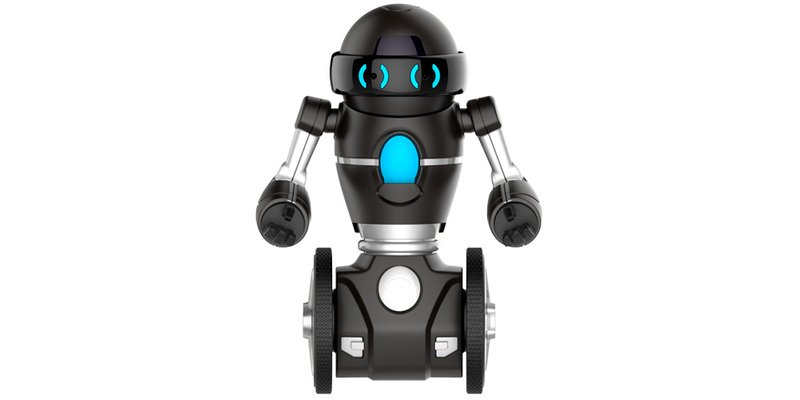 Perched atop unique dual wheels, this multifunctional and autonomous robot is more than just a toy. 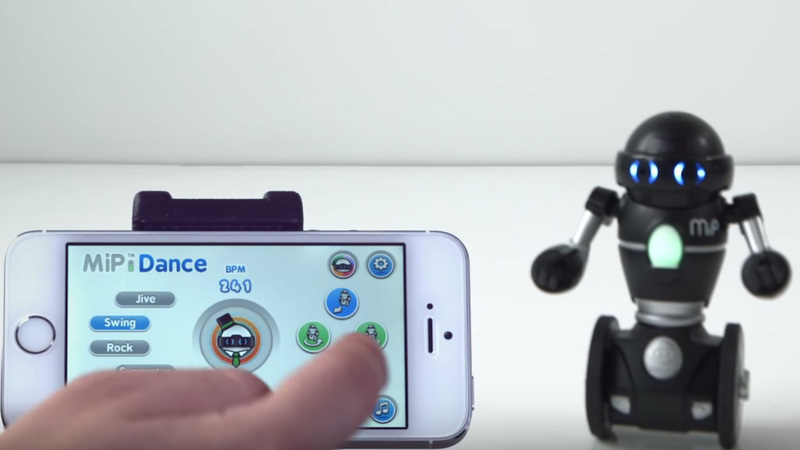 Equipped with GestureSense™ technology, any hand motion controls MiP™, or load up the free MiP App on an iOS or Android smart device, and your eyes will light up at what MiP™ can do. 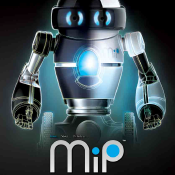 Upgrade your MiP's capabilities with the free MiP App for your Bluetooth Smart Ready device! 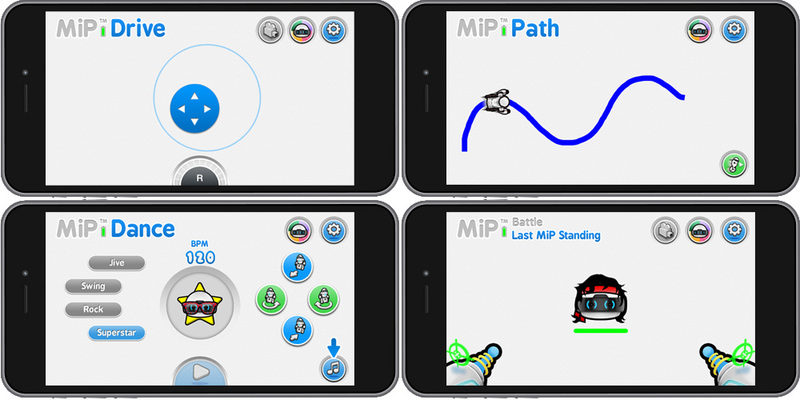 Steer MiP around obstacles, take on other MiP's in battle, dance to your music library and so much more. Check your device compatibility before you buy. 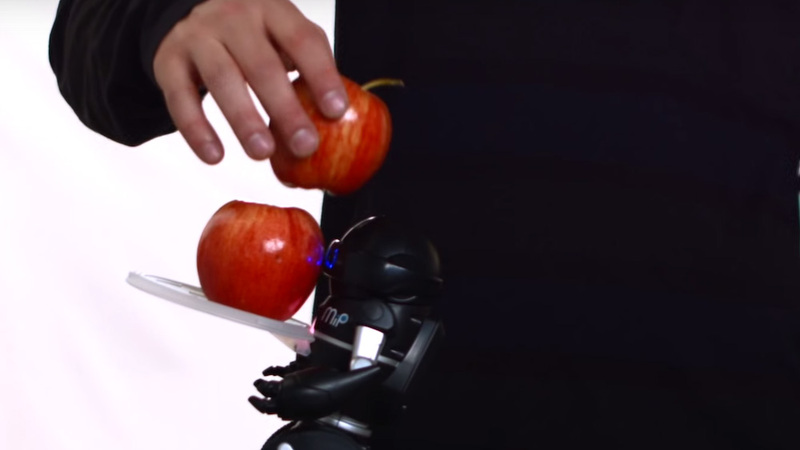 Gyros and a unique pendulum-based balancing system ensure that MiP can stay upright all by itself. 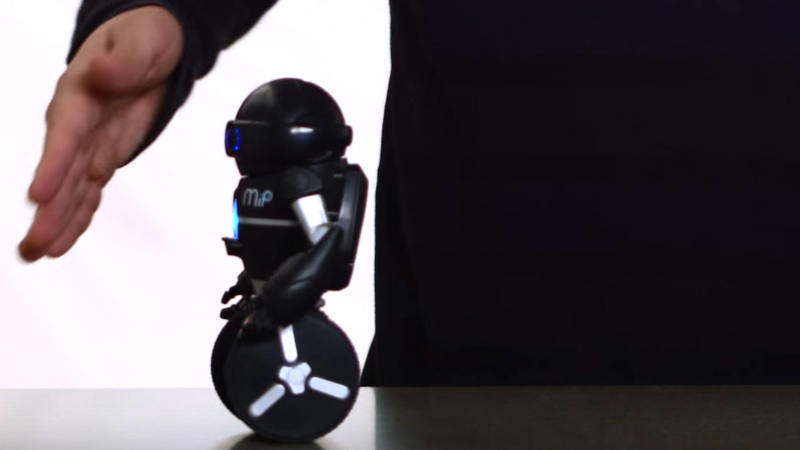 MiP responds to the swipe of your hand thanks to proprietary sensors in its eyes. You can swipe left, right, forward and backward. Hint: the flatter you make your hand, the more surface area for MiP to recognize, and the more responsive it'll be. MiP is a real character. It speaks the language of MiPish, a combination of MiP and gibberish. You can feed it mood chips via the app to see just how whacky it can be! 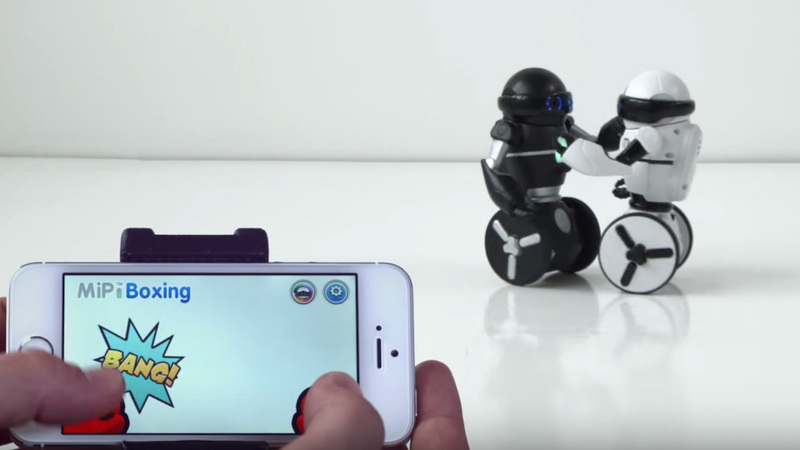 MiP is a strong bot despite its size. With the included tray, see how much you can stack! Hint: It can handle up its own bodyweight! 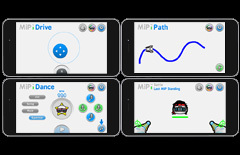 Not only does MiP offer tons of gameplay fun, but there's also an app that enables you to drive, dance, battle, balance, and so much more. Take on tougher environments with the off road set or increase MiP's speed with the racing slicks. How does MiP communicate with smart devices? MiP uses BLE (Bluetooth low energy) technology to communicate with newer iOS and Android smart devices. Using your smart device, you can download the MiP app on the iTunes or Google Play store. Then you can select your MiP from the app and control your MiP. There are many features available in our app and we'll be updating the app regularly. How does MiP recharge or what types of batteries does MiP use? 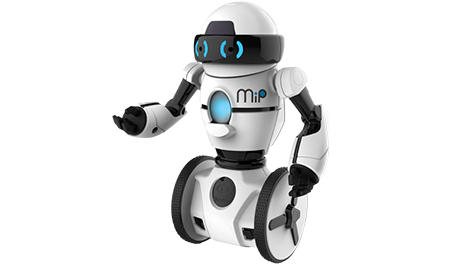 MiP uses 4 aaa batteries that are put into the backside and secured with 3 phillips-head screws. 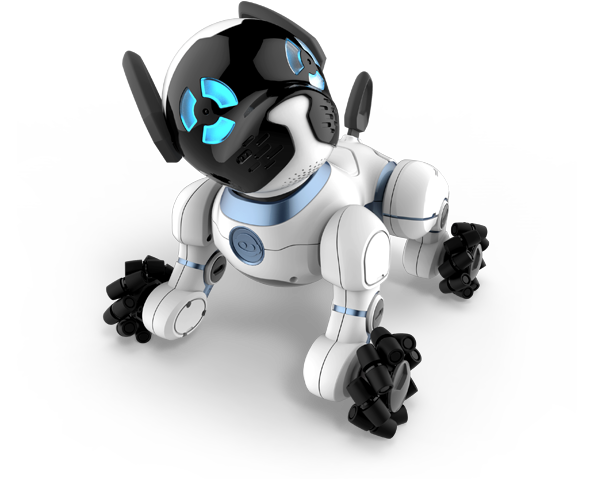 MiP has about 4-6 hours of moderate usage with new alkaline batteries and up to 1-2 days with very low usage. How fast does MiP move? The following measurements were taken when we used the app to control MiP: -MiP can travel .14 m/s or .3 mph on a flat smooth surface! 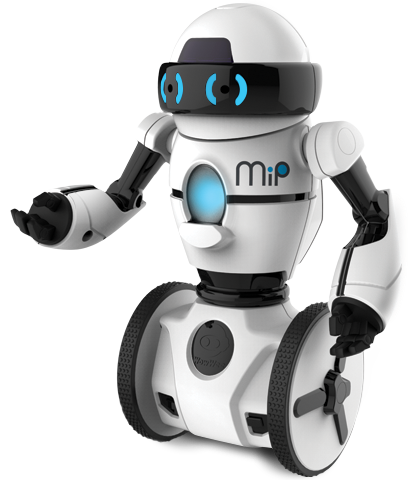 -MiP rotates one full turn every .47 seconds, that's 10 full turns under 5 seconds! 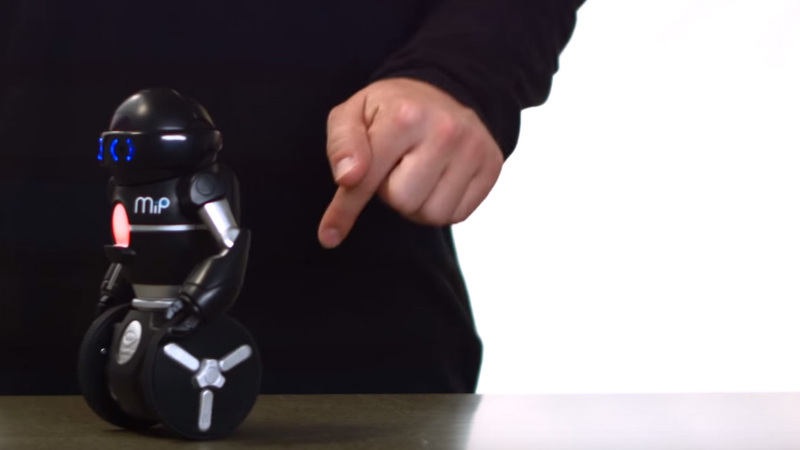 Turning him on: first, you have to load him up with four AAA batteries. Once he has fresh ones in, flip the switch on his back. MiP's eyes will then light up, and he'll say "MiP". Once he does, MiP is ready for action. Place him onto a flat surface and feel him kick into gear. 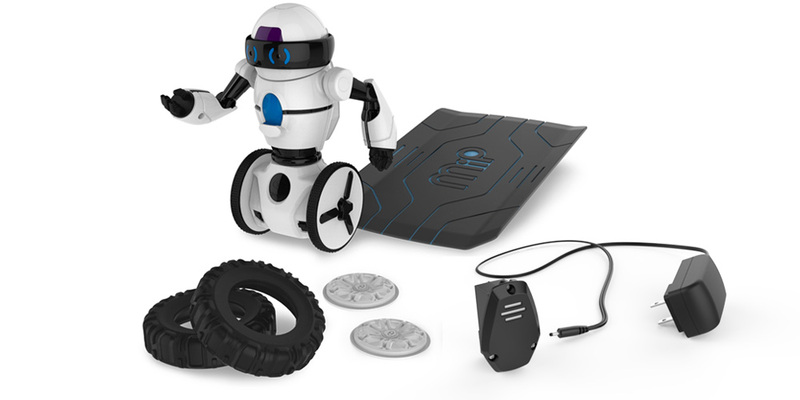 Out of the box, MiP comes with 7 different game modes, which can be accessed by turning his wheels. The default mode is called "MiP mode", represented by the color blue. 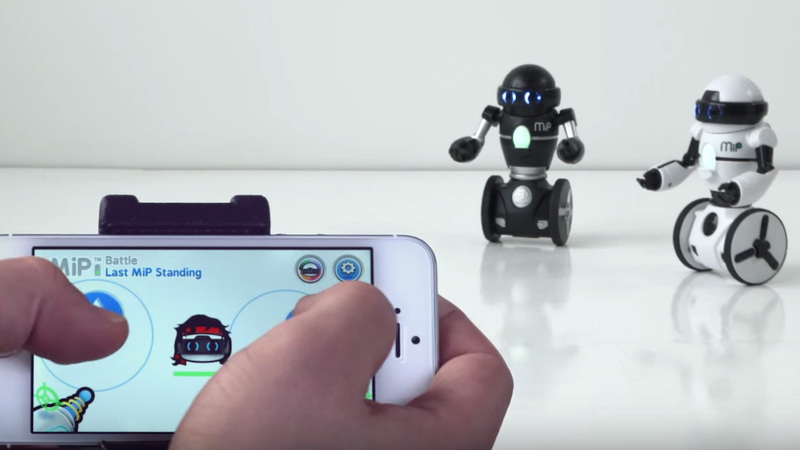 In this mode, the user can use his hands to control the robot. The key to using this mode effectively is to give MiP a wide surface area to recognize. The flatter your hand is when you come at him, the better the response will be. The next mode is called Stack, represented by the color pink. In this mode, the user is supposed to put his tray table onto MiP, and stack as many objects on to MiP's tray as possible. As you do, MiP will say "MiP" faster and faster. His timer then runs out, and he spins around making everything go flying. Then you do it all again! After Stack, comes Cage Game, represented by the color white. Here, MiP will say "MiP go", indicating the start of the game. 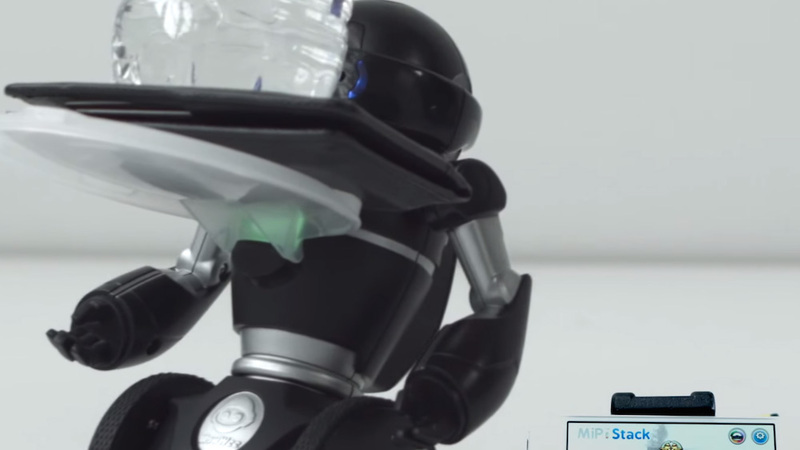 Now, MiP is in a virtual cage and you have to prevent him from escaping by putting your hands in front of MiP's sensors in his eyes. If you don't get there in time, MiP wins, and he'll be a show off about it too! Next, is Tricks mode, represented by the color red. Here, the user must wait for MiP's chest to start flashing, indicating that he's ready to take commands. Now, you can program a sequence of actions. You can swipe left to make MiP turn left, right to turn right, forward to roll forward, and backward to roll backwards. Again, it's important to make your hand as flat as possible so MiP picks it all up accurately. When you're finished giving him tasks, clap twice or tap MiP on the head two times, and he'll play it back for you. 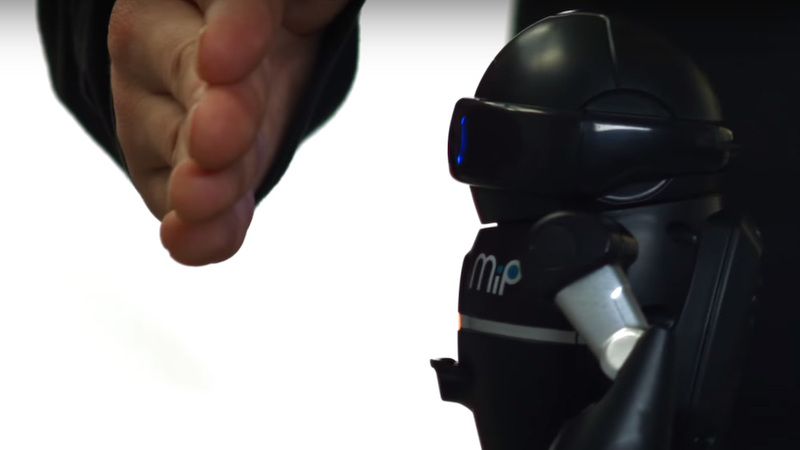 MiP can remember 50 consecutive gestures commands in a row. Next, is Roam mode, represented by the color yellow. 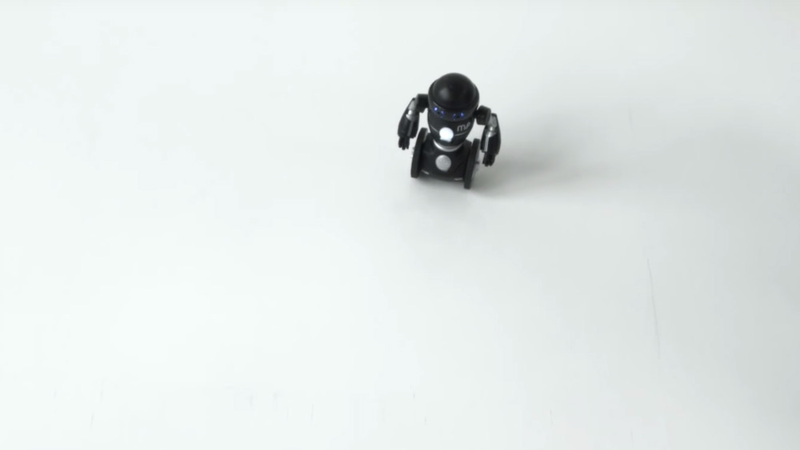 Here, you can place MiP on a flat surface and let him navigate his surroundings autonomously. 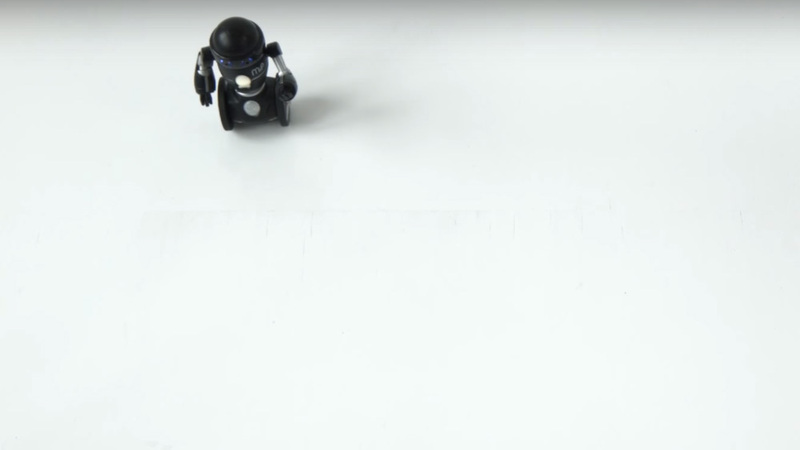 If MiP sees something in his path, he will turn and roll to a different direction. He does not have edge detection however. Be careful not to let him fall of tables or staircases. Lastly, we have tracking mode, represented by the color orange. In this mode, the user can place an object, which in this case is my hands but is not limited to just that, over MiP's eyes. MiP will repeat "MiP" over and over to indicate that he's tracking. 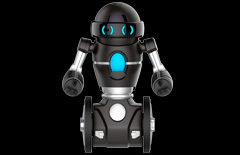 Now he'll follow you in every direction as opposed to moving for pre-determined sequences like in the default MiP mode. Once you've made it through the different game modes, the next thing worth checking out is the MiP app, available for both iOS and Android. Once you've downloaded the app, load it up, and as long as your Bluetooh is enabled, MiP will automatically sync up to your device. There are three important icons in the app worth mentioning. The first is the battery bar, that shows how much juice is left in MiP's batteries. The second is the little MiP head icon, which is the menu button. Here you can scroll through different games and functions. Third, is the settings wheel which lets you adjust MiP's name, MiP's avatar, volume, and gives you access to info about the app. The default game it will put the user into is MiP Drive. In this mode the user uses his left thumb to make MiP move forward and backwards, and his right thumb to move MiP left and right. 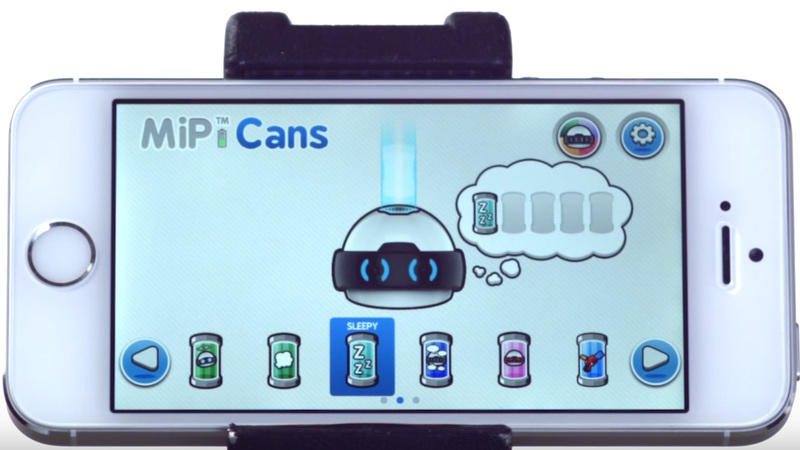 The next icon in the menu is MiP cans. These are little personality chips. If you feed one to MiP, he will take on that personality for a few seconds. You can make him happy, sad, confused, farty, sleepy and more! Next you have MiP Dance. Here, you can scroll through your music library and pick a song you_d like to see MiP dance to. The song will play through your device, not MiP, so make sure the volume is turned up. To choose a song, hit the music button on the bottom right of the screen which will bring up your library. Once you've chosen one, hit play to start the song. 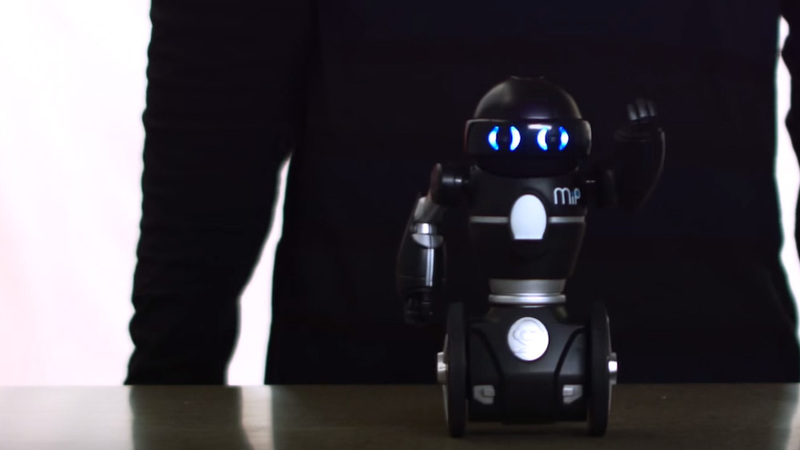 Now you can either watch MiP dance on his own, or direct the way he moves with the buttons on the right of the screen. 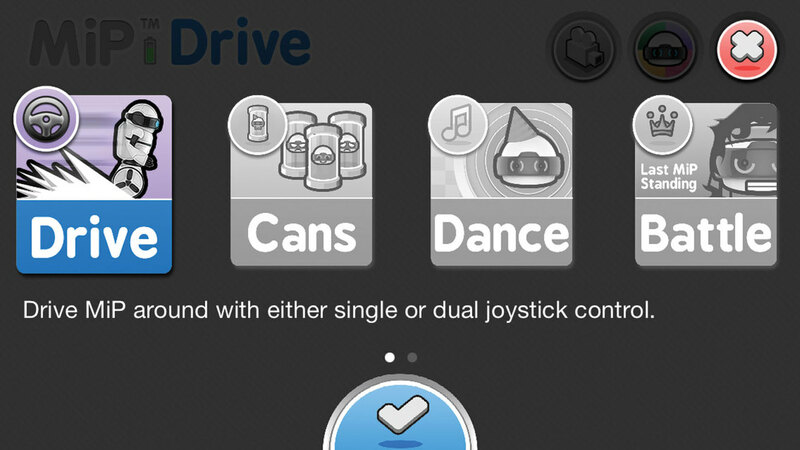 On the left, you can adjust his dance style. He can jive, swing, rock out, or kick it up into superstar mode. Finally, you can adjust the speed of his dancing by tapping the MiP icon in the middle of the screen. Tap it fast to speed MiP up or tap it slowly to slow him down. Next is Battle mode. This is essentially laser tag, so you'll need some buddies to play along with. Within this game, you can drive with your thumbs the same as you would in drive mode, but fire lasers at opponents with the laser blasters on the screen. 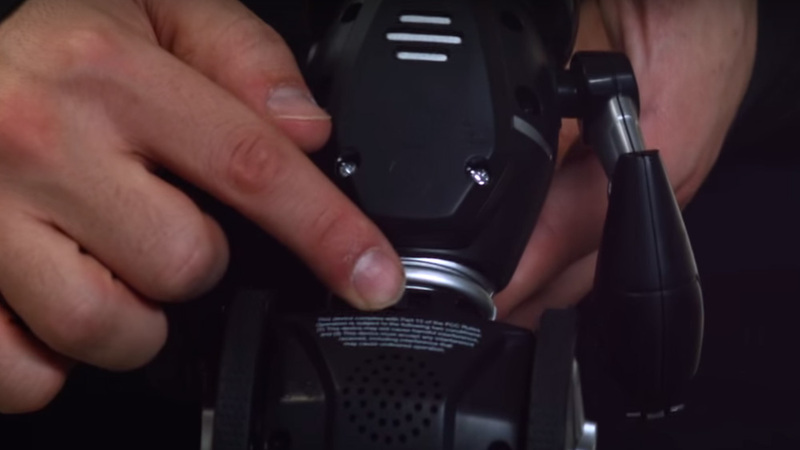 The trick is to aim for your opponents' eyes- this is where MiP's sensors are. To be a master MiP battler, you want to hit your opposing MiP's eyes with lasers while keeping your MiP safe. 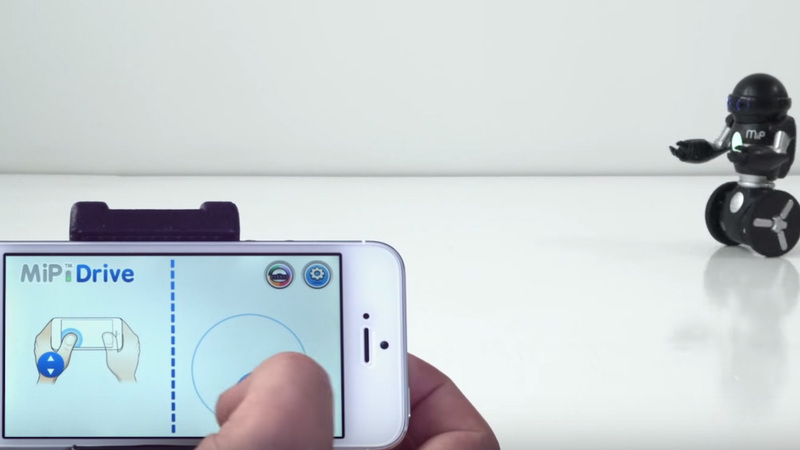 If under attack, your device will begin to vibrate letting you know you've been hit. The first user to see his health bar diminish will lose the battle. Next is boxing, which also needs another user. It works very similar to battle MiP, but here, the user throws punches instead of lasers. However, because MiP's arms aren't mechanized, make sure you put his dukes up before a fight. The sensors in his eyes will pick up damage and again, the first user to see his health bar diminish will lose the battle. The next mode is path. 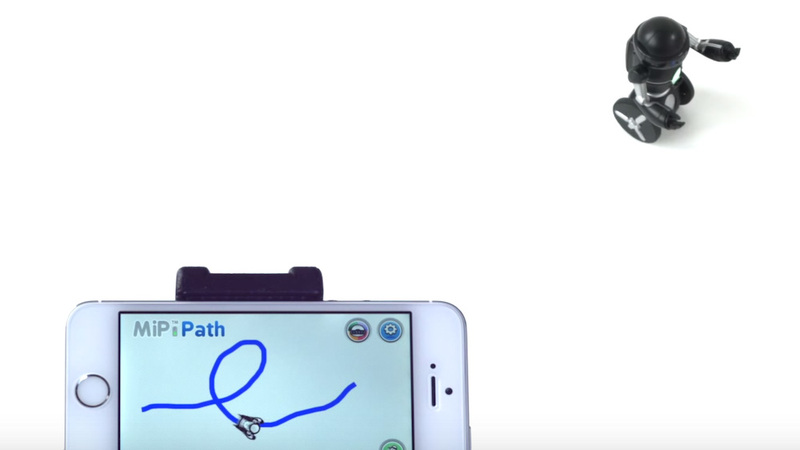 Here, the user can trace a path along the screen of a smart device and watch MiP recreate that path in real time! It's especially fun to set up obstacle courses and try and have MiP navigate through them. In stacking mode, the user must first place the tray table on MiP. When he does, he can begin to stack items onto MiP's tray. The goal of this game is to have the meter reach the top without making MiP fall over!! Careful, this one is addictive! What are MiP's dimensions and weight? MiP can carry up to its own body weight, roughly the same weight as a can of soda. MiP can do this when you attach the carrying tray to its belly. Why is my Android app asking me for a PIN? This should not be the case. Turn off MiP, uninstall the app on the Android device. Reinstall the app. Turn on MiP. Then relaunch the app. There should not be any pin# issue. Need more help? Our support team is standing by. Like MiP, Have you seen CHiP?